Nothing quite like headache-inducing exposition with your cliffhanger, eh? "Dance, puppet, dance!" cries the Conqueror! Next, we rejoin Tony Stark, newly outed as a TRAITOR!, back on Chronopolis among Kang, Mantis, the Professor, Mary Ann and a host of Anachronauts. Kang reveals that their longtime enemy is ready to make his move, years ahead of schedule, and that they must secure this "temporal beachhead" so they can defeat him. (Hey, wait...what are years to time travelers?) Stark returns to Works HQ to find Amanda in the sub-basement. Chased by Stark, she finds freezer units, one of which is occupied by Suzi Endo, which begs the question: who is Cybermancer? That answer must wait until just before cancellation, as Stark coldly kills Amanda then activates Virgil's "Siege Perilous" protocol, synching up with a recently-launched satellite. War Machine flies to The Works while USAgent and Black Widow pursue on land. Meanwhile in Vietnam, Brandt reveals that when he died, the Priests of Pama saved his spirit and grafted it to the body of Moonraker, who in an alternate reality was a trusted member of Force Works. They sent him as a warning against Mantis to be activated when the time was right. When Moonraker crossed from the alternate reality of his creation to this one, his history, including his romantic relationship with Spider-Woman, crossed too. (Say huh?) He says Kang plans to reshape the Earth with his "chronographic powers" which, loosed on Vietnam, caused the young boy's metamorphosis from the last issue. Many will die, but those that mutate like the boy will fill Kang's Anachronaut ranks. Back at The Works, Century, an alien member of the team, returns from a solo adventure as Rhodey arrives. As before, Stark tries to convince Century how "they've all turned against [him]," but he doesn't take the bait and saves Rachel and Rhodey from being blasted to bits. Century takes Rachel away, and Rhodey transforms into his new alien War Machine suit to take on Stark...and it's on like Donkey Kong. But with uglier art. Are Stark and Rhodey in those suits, or did the Hulk take over? Art by Fred Haynes. War Machine and Iron Man square off, and Stark is as fierce as Rhodey's ever seen him. Century discovers Amanda's corpse while fighting Cybermancer. He defeats the villainess handily, while Iron Man and War Machine punish each other. Rhodey can't deliver the killing blow because, well, there are still several parts left in the event. Stark lasers him, refraining from killing him (because there are three issues left in the series!) and flies away, while authorizing Virgil to use deadly force to defend itself from completing its duty to activate the Starcore satellite that will bombard the Earth with the same chronographic energies that affected Vietnam. 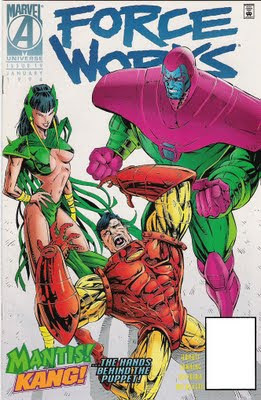 War Machine heals, and after a meeting of the remaining members of the team, he, Scarlet Witch, Fisher Todd and USAgent remain at The Works to shut down the Siege Perilous protocol while Black Widow, Century, Moonraker, Spider-Woman and daughter teleport to rejoin the Avengers. Stark returns to his secret arctic lair and repairs Machinesmith, whom Masque demolished during her escape. Meanwhile, Masque and the assembled members of Force Works and the Avengers compare revelations, and they communicate via telepresence with the remaining Force Works members who are facing Virgil. Masque alerts them to Stark's arctic bunker and a small team consisting of Crystal, Vision, Century and Moonraker teleports there. Marianne Rodgers is seemingly getting past Stark's emotional barriers at last when the team arrives, setting off the facility's alarms. Unable to penetrate the bunker's defenses, the team is contacted by Marianne, who tells them that Stark has been corrupted for years and that (wait for it...) there was a time when a younger Stark was free of that evil. They teleport back to the Avengers' temporary HQ but Moonraker is no longer with them, kidnapped in mid-journey by Kang and Mantis. Eenie, meenie, meinie, moe, which Avenger will be the next to go? Back at The Works, Cybermancer and Virgil (revealed as a super-beefy computerized avatar of Stark...egotistical much?) conduct their attack on the remaining Force Works crew. Thanks to using some holographic images to weasel around some traps, and thanks to Plato, another of Stark's computer systems with allegiance to the team, they're able to abort the firing sequence to Kang's chronographic weapon. Everyone commences another round of uninspired bitching about Stark being a traitorous so-and-so. Can we move along now? Help! 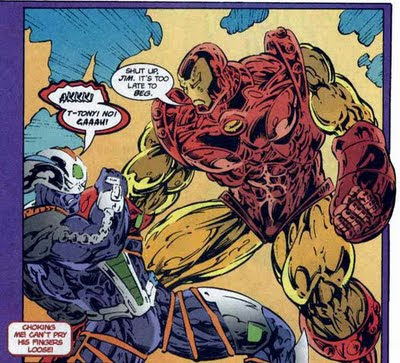 It's a guy with even uglier armor than Rhodey's! You bet we'll move along, but it's into space, where the chronographic weapon in Stark's satellite waits to be triggered on-site! Who can activate the weapon from space, you might ask? It's Dirge, one of Kang's mighty minions, wearing a suit of Warwear just like Rhodey. Also on the satellite is Skye, a woman Rhodey met while on vacation, who reveals that her cosmic-level employer foresaw "The Crossing" and wanted him to combat Stark. To that end, when Rhodey lost his regular War Machine armor, she led him to the Eidolon Warwear as a replacement. She expected him to kill Stark but obviously that didn't happen. Dirge delivers a fatal blow to Skye, who survives long enough to see Rhodey use more of the Warwear's abilities to defeat Dirge. His destiny and that of the Warwear are linked, she says, and that destiny lies....IN SPAAAAAAAACE! Ahem. And oh yeah, Rhodey destroys that pesky satellite. The end. In the last stop before "TimeSlide," Kang and Mantis relentlessly torture Moonraker/Libra at Chronopolis. Older Luna frees him, but Malachi, Tobias, Neut and other Anachronauts bar her exit. She summons her "time-chair" and succeeds in crossing through time to the Avengers, demanding they help Moonraker. Masque knocks her unconscious even as Hercules remembers she was the one who tried to warn them about Stark at the very beginning. When she awakens in Pym's med-lab, Quicksilver and Crystal find her familiar, as do the others. There's no time to rest, however, as Kang's soldiers have followed Luna and Moonraker. Neut cleaves a path deep into the mansion singlehandedly, disemboweling the new Swordsman and knocking the rest of the team on their keisters. Luna throws herself between Neut's energy beam and her parents, taking the brunt of the blow and dying. Neut is ready to kill the team when the revivified, newly-mutated Wasp emerges from her cocoon and takes him down from behind. She's now more wasp than human, but other than that, Hank Pym declares her to be in "perfect physical health--better than [she's] ever been before!" Uh, yeah, but she still looks like a bug, genius! 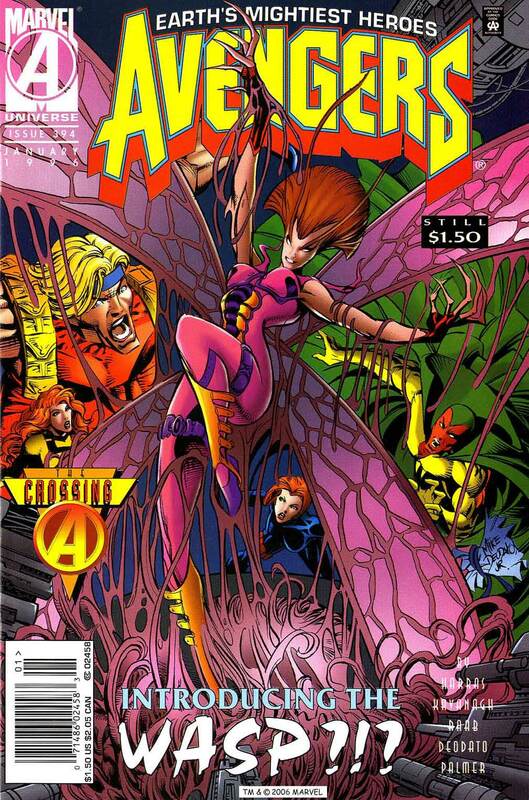 The not-so-winsome Wasp, as designed by Joe Madureira. As the team licks their wounds, Masque and Black Widow discuss their next move. They have a time portal in the basement, but they can't just go back and kill Tony Stark. Masque suggests the best way to stop a genius like Stark is with another genius. And thence begins the madness that leads to...Teen Tony! Sorry it's taken so long to get to this point, peoples, but entry number three (the finale, honest!) will be en route soon enough. Who is Kang's mortal enemy? What more madness could Marvel wring out of Earth's mightiest heroes? Next time: Let's do the TimeSlide (again?)! Oh, "The Crossing." You so crazy. 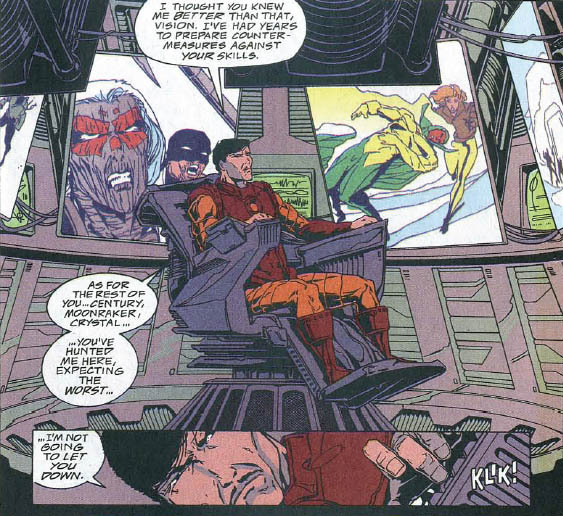 Man, I'd recently read the Iron Man issues of "The Crossing" and I only realise until now, how hermetically sealed off IM was from the rest of the Crossing stuff. The time-mutating stuff? Hardly mentioned. War Machine and Iron Man? Not even mentioned. Nope, it's generally about 7 issues of Tony moping around and only occasionally having anything plot-relevant to do, because they were really hedging with Stark being "the bad guy" but not TOO much of a bad guy, lest they have to walk this back. And oh yes, bug-Wasp. The nearest I can finesse the rationale for this is "Well, Joe Mad did these designs for us, people really like Joe Mad, let's work it into the story uh, somehow." The one thing that I'm acutely aware of with "The Crossing" is that you can just feel the desperation on every page. No one writing it really has the full picture of what's going on, and so they can't resolve anything or move anything that far forward so all they can do is keep the plates spinning . . .and the longer it goes on the more desperate the whole plate-spinning becomes as they add in new threads (the new guy in the Warwear suit never really goes anywhere after Rhodey ditches the suit soon after this, does he?) and I continue to be surprised at how much ink is spilled on trying (and failing) to convince us that Neut is a badass. I've told people that "The Crossing" was so bad that Liefeld taking over Avengers was actually considered a step up, but I'm not sure they really ever believed me, you know. I actually only read the first and final Iron Man issues back when they first came out, and Avengers #395, and that "Age of Innocence" one-shot (most of which stand to be reviewed in the next segment). Yes, you can hear Stevie Ray singing "Tightrope" the whole way, it's true. Still, he DID kill people in other books, just not in his own series. Wonder if that's intentional? I wanna see Neut return one day, dammit! Sadly I think you're right, regarding Liefeld being a step up from this byzantine stuff. Although, wasn't Mark Waid brought in for the final few issues during Onslaught? Or was that only to tie things together in a semi-neat bow? Oh, you missed such a wonder gumbo of crazy by skipping the issues in-between because hoo boy, it's like a whole other story is going on there and nobody told the Iron Man guys (odd, since Terry Kavanagh was writing it and shepherding "The Crossing" in general) and they're trying to portray Iron Man as a victim of circumstance and it so does not work (apparently, he blacks out and . . .kills people? But he's apparently been planning it on a conscious levels as well. Well, so long as it's clear) I doubt it's possible (or advisable) to lay any accusations of "Intentional" at the feet of "The Crossing." I feel like, much like The Hitchhiker's Guide To Galaxy, it has a lot of stuff they put in just because it seemed like a good idea at the time. 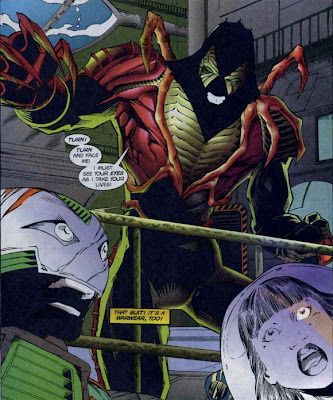 If he's the villain behind FEAR ITSELF it could only help things, really. Maybe next year . . . It was, really. 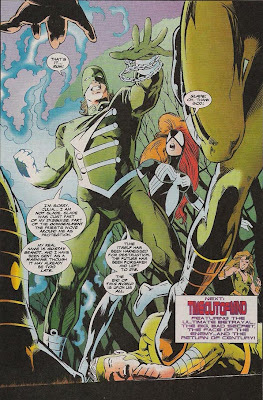 For one thing, it gave us six issues of Liefeld and Loeb running down blind alleys, followed by six more issues of Walter Simonson sending it up. As to Waid, I think we was just dropped in to tie things up--by this time Heroes Reborn was a fait accomplis so all that mattered was filling the spot on the schedule. Good thing comic companies don't work that way now, eh? I can hardly wait. For all it's faults and the hatchet job on Iron Man, "The Crossing" stands alone for just being so blatantly them throwing crap against a wall and hoping some of sticks. My memory is that there was poor communication between editorial and the suits who took the Heroes Reborn decision. The result was that Mark Waid signed up for the Avengers in the belief that it was for a reasonable ongoing run and dismissed the HR rumours as ridiculous. He declared in a subsequent interview that he wouldn't have taken the assignment if he had known it would only be for one issue and a couple of crossovers. The biggest creative problem IMHO was that the storyline came out at around the time that Bob Harras was made the (restored) editor-in-chief and stopped writing the Avengers midway through. Harras had been dropping hints for the Crossing for over a year so presumably had some idea where it was going and might have made it a bit more coherent.